In the main shrine hall of Tergar Monastery, a large chair with a curving back covered in luminous white silk has been placed in front of the Buddha. His Holiness the Karmapa has taken his seat there to witness and participate in today’s debates on the Middle Way (Madhyamaka) view. The participants are senior monks and teachers from various monasteries, who have formed two groups, one of the defenders, seated behind a row of ornately painted tables, and the other of the questioners, who are gathered behind a standing microphone about fifteen feet away. Displayed on two screens flanking the Karmapa are digital clocks, counting down the split seconds of the fifty minutes for this debate. The debate is unhesitating, animated, and vigorous. 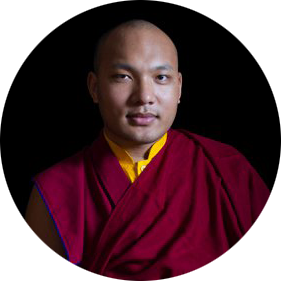 In the midst of the intense exchanges, the Karmapa listens with complete attention, sometimes with a smile, sometimes with a critical look. He raises his arms out, stopping the debate to challenge and clarify. The usual protocol of great deference is not in place as the debaters come back with forceful replies. 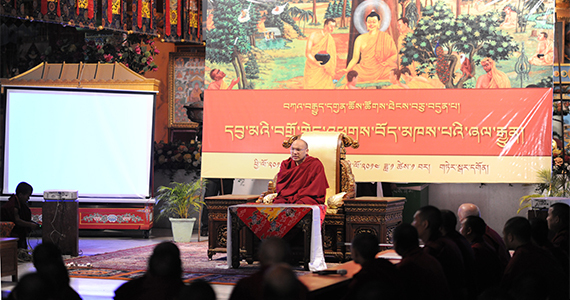 The Karmapa and his disciples are responding to each other as monks have throughout centuries, with the full involvement of body, speech, and mind. The topics of the debate cover key points of the Middle Way view. Is an instance of the definitive meaning, the actual ultimate or the nominal ultimate? How does the meaning of the actual and nominal ultimate shift in the three instances of no analysis, slight analysis, and thorough analysis? How do we know what is the correct view of Middle Way? Can we define it as that which leads to the realization of emptiness? What is the true difference between the empty of self (rangtong) and the empty of other view (zhentong)? Responding to this, the Karmapa suggested that the empty of other view works within the framework of the presence and absence of something while the empty of self view works within the framework of being and not being something. The questions are key and invoke the depths of the philosophical heritage of the lineage. When the buzzer brings the end of the fifty minutes, the Karmapa is still debating. His attendants and security come to give him his shoes and move away the table from in front of him, but he moves it back so he can slap it with his hand to make a point and continues to talk for a while. Long after it’s over, the liveliness of the debate reverberates through the air.